The post Guess What's in The Picture got a lot of attention. And, it forced me to take a good long look at hot dogs. True confession - I love hot dogs. I'm not gonna lie to you guys. And the thought that they were made with this gunk upset me. So, what is a Snack Girl to do? Well, I spent some serious time in the hot dog section of the supermarket reviewing the labels. The good news was that very few hot dog labels including the ingredient "mechanically separated chicken". Secondly, there were some brands that I hadn't seen before. My favorite brand of hot dogs is Nathan's. For college, I lived in Brooklyn, NY and I have visited the original Nathan's. Let's just say it is a sentimental favorite. Applegate Farms sent me some coupons to try their hot dogs, so I gave them a chance. They are organic, have no nitrates, are antibiotic free and about twice the cost of the Nathan's franks. (I bought my Nathan's franks for $2.50 and the Applegate Farms cost $5). 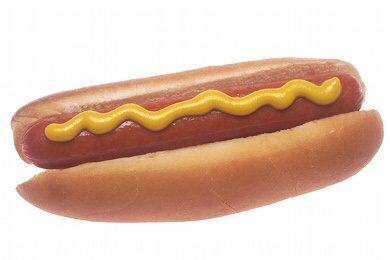 What should you look for in a "healthy" hot dog? What made me think that I should consider spending more on hot dogs is the fat content. 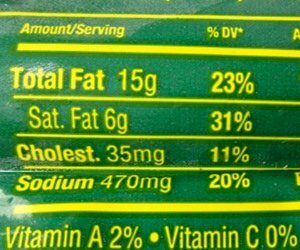 Check that out 15 grams of fat in Nathan's versus 6 grams in Applegate Farms hot dogs. The Applegate Farms hot dog has 90 calories versus Nathan's 170 calories!! The Nathan's frank is BIGGER (57 grams versus 48 grams). If the Applegate Farms frank was 57 grams it would still be 106 calories - still 64 calories less than Nathan's. Why? Both companies are using beef to make their hot dogs - but Applegate Farms (and other organic meat producers) are using grass fed beef. Grass fed beef has less fat per pound than grain fed beef. Of course, Nathan's is using grain fed beef because that it the majority of beef that is on the market. "Grass fed" is more expensive and harder to find. Applegate Farms uses only muscle meat in their hot dogs - which would be naturally less in fat versus other parts of the cow than Nathan's uses. Honestly, I couldn't tell the difference. They are both salty and meaty and go great with mustard. I still wouldn't advise eating a lot of hot dogs (because of the sodium content), but it is nice to know there is a delicious snack-sized option. Ninety calories is a great size for a snack. Chicken McNuggets Experiment: Rot or Not? Thanks for the note about Applegate farms. If I see them i will have to give them a try. Have you seen the Little Hillshire Farms ones though? 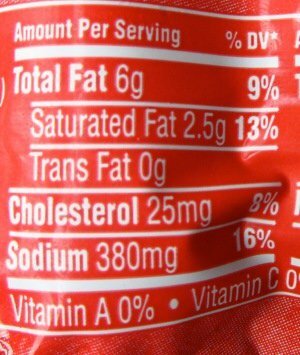 Whate are the stat on a cocktail weinie sized hot dog versus a grass fed-beef dog? thanks for all the helpful info! @Leslie I haven't seen the Little Hillshire Farms ones - I will check them out next time I am in the supermarket. Thanks! Also definitely worth mentioning that non-grass-fed beef comes from cows that have spent their lives in filthy, miserable conditions. If the animal abuse isn't enough to stop you, consider the ecoli levels in factory farms and your health!! Interesting as usual! Any info on what affect the casing material has on fat content? I love hot dogs. I usually buy Oscar Meyer light which are only 90 calories or Ball Park Lite. I guess I should take the time to read the nutrional label. I do not have them very often but just once in a while you gotta have a grilled dog. i love hotdogs! it reminds me of football season and summer...my fave! I will def try applegate. My husband loves hotdog and I get so worried with the nitrate content and the high sodium content. I often buy them at local butcher that has nitrate free hotdogs but it is good to know there is a healthier option at the grocery store. I cannot eat red meat(not b/c of choice) but love the smell mostly at a baseball game! Wow $5 for a pack of hot dogs I think the price would be a good incentive for portion control for me. We usually buy the turkey or chicken franks... I guess those are horrible and made from that goop you had a picture of a while back:-( I guess really we have been eating more sausages lately, well over the summer like polska kielbasa and hot links... I'm sure the same rules apply. Thanks for this post! Will be checking for the dogs next time I go to the store! You may want to look into Hebrew National as well. I LOVE hot dogs, but only the beef ones. Finding a low cal version was very frustrating but then I ran into 97% Fat Free from Hebrew National. They are only 1 point for WW!!! And they actually taste good! I will have to read the label again, but I know it doesn't have mechanically separated chicken. Hey Deb - Please know that all of our hot dogs aren’t in a casing (expect for our Big Apple Hot Dog which is in a lamb casing). We cook them in a cellulose casing to keep shape, but then remove it before it is packaged. The outside of our Applegate hot dogs that people say “feel like they are biting into a casing” is actually just the proteins that were raised to surface during the cooking process. So in short (or long! ), the hot dog Lisa is talking about doesn’t have one, so it won’t affect the nutritional content at all! Hope this helps! I just made pigs in a blanket with some Applegate dogs the other night! I love hot dogs, but gave them up for years because of all the really gross stuff that goes into them and because of the way the animals were raised. As far as the cost goes, you get what you pay for. I've been eating Applegate dogs for a while now. They're so yummy and not ladened with grease! Another bonus about Applegate is that if you have any questions about their products, you can leave a message for them, and they actually call back to fully answer ALL your questions! So far, I'm a believer in this product and I'm excited to see your post about them today. BTW, I believe I saw two different sized dogs at Whole Foods last week (a 57 and 48). I'm so glad that there's a focus on using grass-fed beef! I've found a local farmer who I'm going to start buying meat from and they make nitrate-free hot dogs and bacon - I'm excited to try them out. I love applegate farms bacon! I have also had the hot dogs and they were pretty good. The previous poster is correct, you get what you pay for. My family goes without meat if we can't find hormone free, grass fed. The idea of eating anything else really, truly makes me want to hurl. I LOVE Applegate chicken and apple sausages! Hot dogs are such a great occasional treat - but the thought of what's inside makes me gag. So this post is right on time as my 2 year old is starting to show interests in hotdogs, I will certainly give these a try! I've been eating Applegate Farms for years. They only use the best ingredients and everything tastes great. I rarely eat hot dogs but I keep AF in the freezer for whenever the urge strikes me. i believe that trader joe's sells applegate hot dogs and probably other of their products, too. prices are probably better than at other places. do cut them up lengthwise and carefully for little people! Interesting, I only eat hotdogs once in a blue moon because whenever I eat them I get what I call "hotdog poisoning" where I get bad headaches and stomach pain. I think it has something to do with the nitrates in them. I will have to give these a try since they are nitrate free.